HORIZON CITY, TEXAS (November 3, 2016) - More than 150 explosive devices and materials used to create them were allegedly found in the home of Horizon City biker arrested Tuesday on a federal charge of unlawful possession of a machine gun, court documents show. Loren Jay Bingaman, 48, was arrested by El Paso Police Department officers as part of a multi-agency investigation into an assault and robbery of two members of a motorcycle club on Aug. 3 outside Hot Chicks Wing House at 2281 N. Zaragoza Road. Bingaman was rebooked into El Paso County jail on Wednesday on a federal charge of unlawful possession of a machine gun after local, state and federal law enforcement agencies executed a search warrant on Tuesday at his home in the 400 block of Benton Street in Horizon City, according to a complaint affidavit. The agencies investigating the case include the U.S. Bureau of Alcohol, Tobacco, Firearms, and Explosives, FBI, Texas Department of Public Safety, El Paso Police Department and the Horizon City Police Department. State troopers allegedly found a box they suspected contained explosives in a garage at Bingaman’s home. U.S. Army Explosives Ordnance Disposal officials were called to help identify the possible explosives, documents state. Ordnance disposal officials allegedly found 151 training grenade blasting caps and four military-type flares. They told ATF agents that the blasting caps and flares are “considered an explosive device that can cause bodily injury and are therefore not manufactured for the public,” the affidavit states. Investigators also found multiple firearms in a storage room in the garage, documents state. One of the weapons was allegedly an “AK style closed bolt rifle.” Another rifle was allegedly found on a workbench in the garage. Disposal officials also found potassium chlorate and potassium nitrate in 14 plastic containers; aluminum flakes in nine plastic containers; several bags containing potassium nitrate; and 10 grenade hulls which were welded shut at one end, the affidavit states. ATF agents checked the National Firearms Registry Transaction Record and Federal Licensing System and found that Bingaman was not registered to possess destructive devices or machine guns, documents state. Investigators also found another suspected machine gun in “various states of manufacture and assembly” in a storage shelf within a shed at the home, the affidavit states. The search warrant executed on Bingaman’s home came after the El Paso Police Department arrested him and seven other bikers on Tuesday in connection with the assault-robbery case in East El Paso in August. Believed to be a member of the Brass Knuckle motorcycle club, Bingaman was arrested on one count of engaging in organized criminal activity-aggravated robbery. He posted a $50,000 bond on the state charge on Wednesday, but was rebooked on the federal charge the same day. According to jail records, no bond has been set on the federal charge as of Thursday afternoon. Bingaman remained in El Paso County jail at that time. The other reputed Brass Knuckle motorcycle club member arrested in the case was Jose Luis Holguin, 41. Also arrested were members of the One motorcycle club, including Arnulfo Ramirez, 42; Dean Rascon, 45; Alejandro Jimenez, 40; and Aaron Michael Palmer, 37. Bandidos member Carlos Sepulveda, 48, was also arrested. 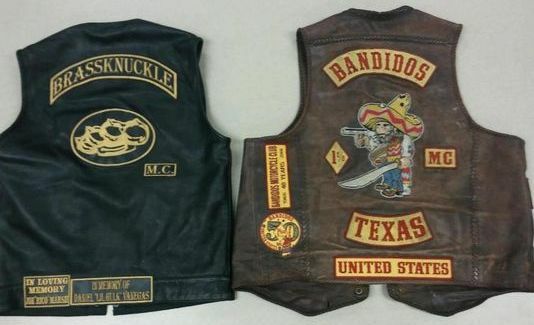 Several leaders of the Bandidos were previously arrested in August in connection with the assault-robbery case. The leaders arrested were Bandidos chapter president Juan Martinez, 60; sergeant-at-arms James Heredia, 45; and secretary Thomas Decarlo, 32.